(PhysOrg.com) -- In a special double flyby early next week, NASA's Cassini spacecraft will visit Saturn's moons Titan and Dione within a period of about a day and a half, with no maneuvers in between. A fortuitous cosmic alignment allows Cassini to attempt this doubleheader, and the interest in swinging by Dione influenced the design of its extended mission. The Titan flyby, planned for Monday, April 5, will take Cassini to within about 7,500 kilometers (4,700 miles) of the moon's surface. The distance is relatively long as far as encounters go, but it works to the advantage of Cassini's imaging science subsystem. Cassini's cameras will be able to stare at Titan's haze-shrouded surface for a longer time and capture high-resolution pictures of the Belet and Senkyo areas, dark regions around the equator that ripple with sand dunes. In the early morning of Wednesday, April 7 in UTC time zones, which is around 9 p.m. on Tuesday, April 6 in California, Cassini will make its closest approach to the medium-sized icy moon Dione. Cassini will plunge to within about 500 kilometers (300 miles) of Dione's surface. 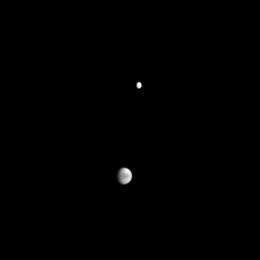 This is only Cassini's second close encounter with Dione. The first flyby in October 2005, and findings from the Voyager spacecraft in the 1990s, hinted that the moon could be sending out a wisp of charged particles into the magnetic field around Saturn and potentially exhaling a diffuse plume that contributes material to one of the planet's rings. Like Enceladus, Saturn's more famous moon with a plume, Dione features bright, fresh fractures. But if there were a plume on Dione, it would certainly be subtler and produce less material. Cassini plans to use its magnetometer and fields and particles instruments to see if it can find evidence of activity at Dione. Thermal mapping by the composite infrared spectrometer will also help in that search. In addition, the visual and infrared mapping spectrometer will examine dark material found on Dione. Scientists would like to understand the source of this dark material. Cassini has made three previous double flybys and another two are planned in the years ahead. The mission is nearing the end of its first extension, known as the Equinox mission. It will begin its second mission extension, known as the Solstice Mission, in October 2010.